German industrial metallers Rammstein have confirmed they will be coming to the UK for one-night-only in 2019. 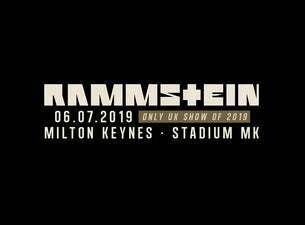 The newly announced date will see the band headline Stadium MK in Milton Keynes on 6 July 2019. The gig is part of their first-ever stadium tour. The news comes shortly after the band revealed in a post on their official website that new music is coming, and that their seventh studio album is almost completed. First formed in 1994, Rammstein boast the accolade that their six-man line-up has remained unchanged. No mean feat for a band of their stature and longevity. Comprising of lead vocalist Till Lindemann, lead guitarist Richard Z. Kruspe, bassist Oliver "Ollie" Riedel, rhythm guitarist Paul H. Landers, keyboardist Christian "Flake" Lorenz and drummer Christoph "Doom" Schneider, the band helped found a subgenre within German hard rock and metal that later became known as Neue Deutsche Härte. While the majority of their songs are in German, they have also performed songs entirely or partially in other languages including English, Spanish, French, and Russian. Rammstein's award-winning live shows are known for their pyrotechnic elements and both on and off-stage theatrics. To date, the band have released six studio albums, including their debut Herzeleid in 1995, Sehnsucht (1997), Mutter (2001), Reise, Reise (2004), Rosenrot (2005), and Liebe ist für alle da (2009). Their new album is planned for release this year.